First row: Bill Sykes, Manager; Bobby Butler, Bobby Wilson. Lawrence Smith, George Hall, James Lee, Jack Aheron, Johnny Grogan, George Chatham, Jimmy Wright, Connie Hill, Bobby Younts, Glenn Fuqua. Second row: Charles Mitchell, Kenneth Harter, Gene Underwood, Douglas Tucker, Ralph Via, Fred Gillespie, Billy Fulton, Jimmy Hankins, Keith Richardson, Ray Martin, Bobby Hawkins, Richard Carter, Jerry Warren. 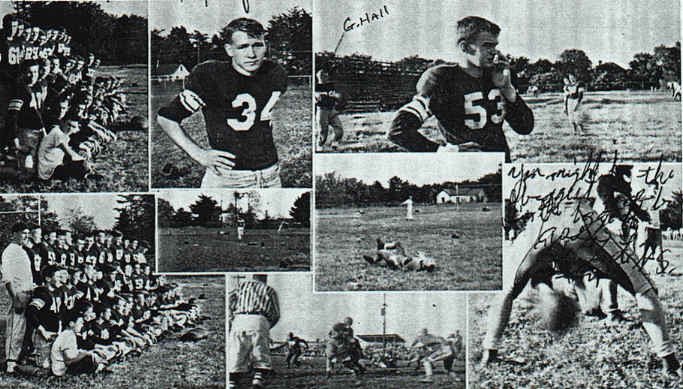 Third row: Coach Rhodes, R. J. Martin, Bobby Moore, James Black, Howard Sheffield, Cleo Wickham, Numa Martin, Winfred Hoover, Clay Hall, Richard Jones, Revelle Morrison, Bud Roberts, Coach Bridgewater.